Did I see another planet? Are those other planets or other stars? Or is that a lens effect? EDIT: The bright object in question was ~60 degrees above the horizon, and ESE of me (East-south-east). I took the picture on 3-25-16 from Madison, Wisconsin. EDIT: Question answered, more clear picture added FYI. Cross-posted to Astronomy and Photography. Please don't do that. It's against site policy because it fragments answers and wastes people's time when they write an answer to something that's already been answered elsewhere. You don't say what time you were looking. Here is a screenshot from Stellarium at 10pm Wisconsin time on 25th March 2016. Jupiter is in the ESE, but the altitude is a bit lower than 60 degrees. Seems fairly conclusive. You were seeing Ganymede and a Europa/Io combination. 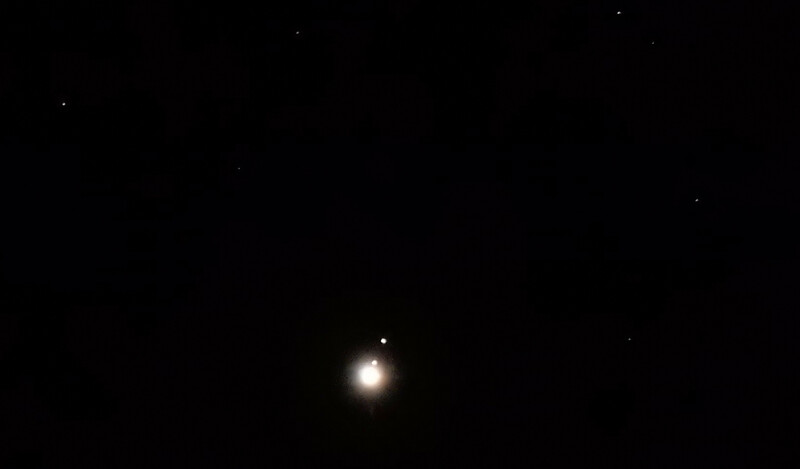 That should be Jupiter and his 4 Galilean moons. They are usually very well visible even with very cheap equipment and a nice experience for amateur astronomy. On your picture 2 of them seem missing, maybe they were cut-off by the field-of-view, or possibly as a commenter pointed out, they might be behind the planet. You can test that notion actually, as Io runs around Jupiter pretty fast and can show significant movement relative to the planet on a timespan of ~2-3 hours (a typical observing session). So if after 2 hours another 'diamond' appears behind Jupiter, you can be pretty sure it to be the volcanic moon Io. This appears to be Jupiter and two of its four "Galilean" moons, being the four discovered by Galileo with his telescope in 1610. 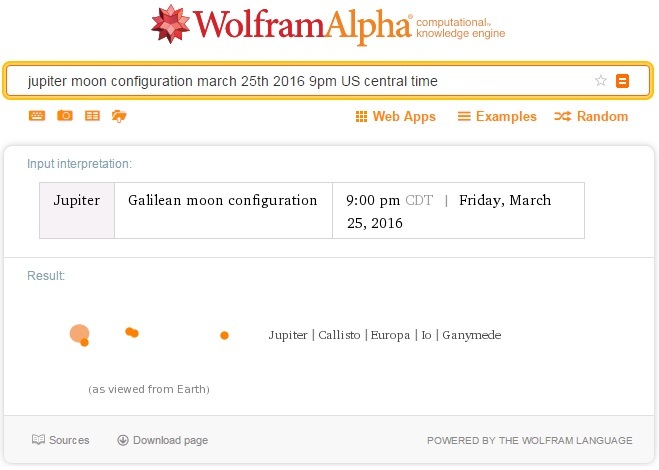 I searched with Wolfram Alpha (http://www.wolframalpha.com/input/?i=jupiter+moon+configuration+march+25th+2016+9pm+US+central+time) to try and determine which moons you were looking at, and the answer was quite interesting. 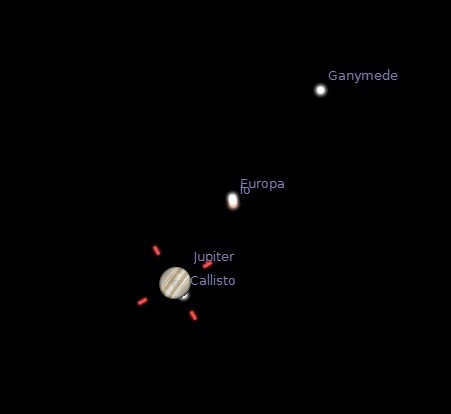 Callisto was too close to Jupiter (as viewed from Earth) to be seen in your image. 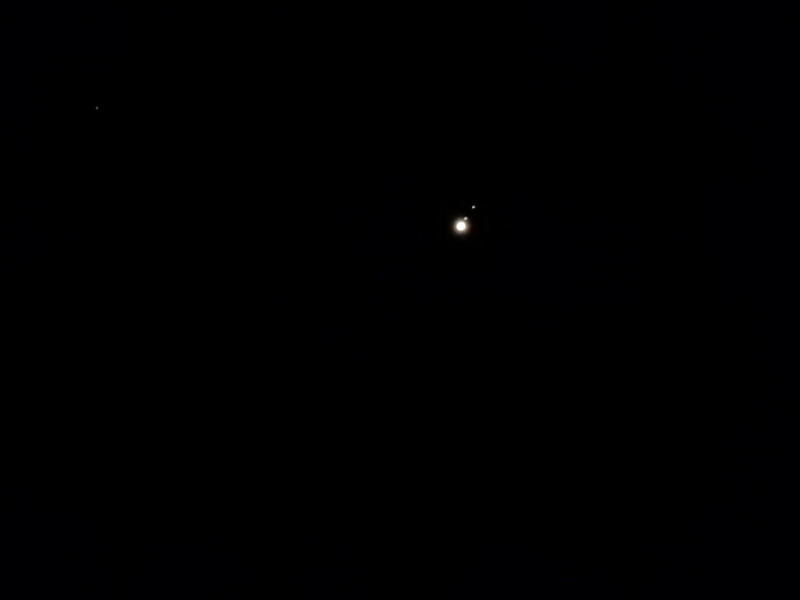 The outermost object is definitely Ganymede, and the other object appears to be a combination of Europa and Io, as these were very close (again, as viewed from Earth), so much so that they appear as one object in the image. Hope this helps. This question is issued from http://astronomy.stackexchange.com. The text is available under the Creative Commons Attribution/Share Alike .